Platinum Tyre Equipment | Tyre Fitting Van + Garage! There was a time when the Atlas Platinum badge on your garage equipment meant nothing to anyone this side of the Atlantic. A lot has changed then. Not only is Atlas Platinum a serious contender in the tyre machine industry, but there is no other choice for some fitters! Take TQ1 MOT Centre in Torquay for example. 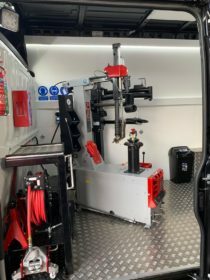 When this award-winning garage decided they wanted to upgrade their tyre fitting solution they knew only the finest machines would do. Quality mattered and they needed a brand that could deliver. After speaking to the Platinum sales team TQ1 settled on a top of the line Atlas Platinum PTC520 tyre changer and PWB55 balancer combo. 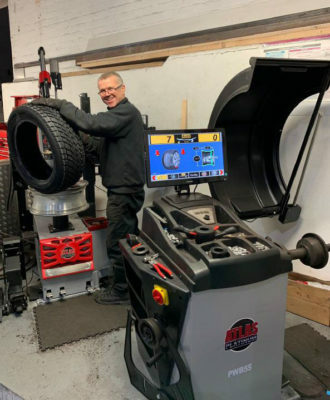 Following a successful install and introduction to the machines, Nigel Millin, owner of TQ1, got in contact with Tyre Bay Direct to compliment the team on the level of care and time taken to explain the value in spending a little more on Atlas Platinum. Of course, this is all part of the Platinum experience. You’re not just buying new machines. You’re gaining complete access to our team of experts. They take the time to ensure you understand the machines and how they can make fitting more efficient for your business. As a result of the success he has enjoyed in tyres already, and the faith he has in the Atlas Platinum brand of equipment, Nigel has also ordered another Platinum tyre equipment package which has now been installed on his mobile fitting van! 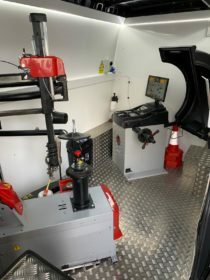 It may often be considered unusual to put equipment of this value and sheer size on a van, with people normally opting to have compact and low-cost machines at a compromise of performance. So impressed were the guys at TQ1 that the continuity remained of having the same equipment and Atlas Platinum was chosen again. Pictures really do not do this one justice. The job has been completed to an extremely high spec and is truly very impressive, possibly the best fit out we’ve seen! This entry was posted in Atlas Equipment, Garage Equipment, Mobile Tyre Fitting and tagged Atlas Platinum, CaseStudy, Tyre Fitting Van.